The Minister of State for Development of North Eastern Region (I/C), Prime Ministers Office, Personnel, Public Grievances & Pensions, Atomic Energy and Space, Dr. Jitendra Singh addressing the inaugural session of conference on Non-Communicable Diseases, in New Delhi on April 18, 2017. New Delhi: The Union Minister of State (Independent Charge) for Development of North Eastern Region (DoNER), MoS PMO, Personnel, Public Grievances, Pensions, Atomic Energy and Space, Dr Jitendra Singh has called for focus on control of Diabetes in young and said that this is not only a health priority but also a national priority considering the invaluable potential of the youth energy in the making of “New India”. Addressing the inaugural session of conference on Non-Communicable Diseases as chief guest here today, Dr Jitendra Singh said that the disease spectrum in India, over the last few decades, has shifted from Communicable to Non-Communicable Diseases as a result of which, Type 2 Diabetes Mellitus, Heart Disease and Cancer have occupied the centre stage. This has, at the same time, also resulted in huge social and economic burden on society which has more than 65% of population below the age of 45 and, therefore, cannot afford any drainage or wastage of valuable youth potential. Dr Jitendra Singh cautioned that more than the rapidly spreading epidemic of Diabetes, the more serious concern is upsurge of Diabetes in younger age groups and among hitherto lesser affected sections of the society and lesser affected parts of the country including rural areas and village folk. This, he said, is also, to a great extent, because of the breakdown of the rural-urban divide resulting in unhealthy lifestyle changes across all sections of society. 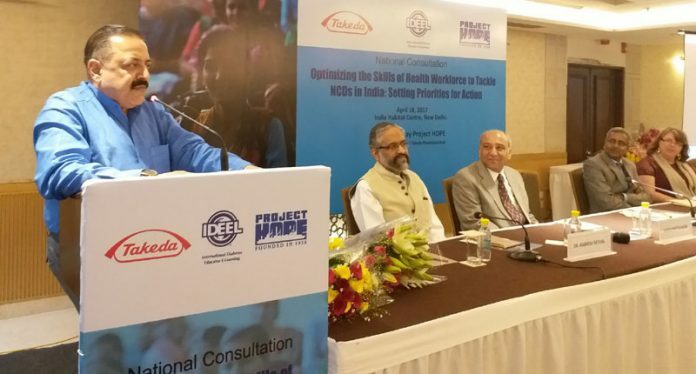 Making a strong plea for engaging in public-private partnership (PPP) modules, Dr Jitendra Singh said, the Government agencies, social scientists and health professionals will have to work in tandem to devise strategies for control and prevention of Diabetes before it appears. Underlining the Central Government concern and priority for health issues, Dr Jitendra Singh referred to the recent decision of the Government to streamline and control the prices of cardiac stents used for heart patients. He also referred to the Government’s move for use of generic medicines and to introduce a comprehensive health policy under the guidance of Prime Minister Shri Narendra Modi. Considering the topography of some of the far-flung and inaccessible areas of the country, Dr Jitendra Singh said, he had also proposed the idea of having “Air-Clinic” set up inside a helicopter with a specialist and requisite equipment as well as paramedics which could be used as an OPD at more than one places on a single day.